I will offer this entire post on just this verse. I will probably not do it for every single verse in this series, that will take forever, but stop a bit in places where it can give us some information on the misperception that many have and gives us a better understanding of the Revelation. As mentioned in my previously post, we were told early in verse 1 that the vision appears to John through the vision, and here, in verse 7 we find the “language” imagery in the book. Anyone who reads quickly throughout the Revelation will probably come up with that John has a little strange imagery, an imagery that can be difficult for us and our culture to understand. John was a pure Jew, and was familiar with the imagery used in Scripture, largely in line with Matthew and Jesus, who also spent a lot of Jewish imagery. Here in Revelation John pick up again the old Jewish imagery, taken from many ancient prophets, and these must be understood symbolically. The burden of Egypt. Behold, the LORD rideth upon a swift cloud, and shall come into Egypt: and the idols of Egypt shall be moved at his presence, and the heart of Egypt shall melt in the midst of it. (Isa. 19:1). I do not believe that someone will translate this to the Egyptians literally saw God the Almighty sitting on a cloud. I mentioned that Jesus uses such language and so does he when he among other things predicts a judgment of the high priest. (Remember, the high priest along with the temple representing Judaism). “And the high priest arose, and said unto him, Answerest thou nothing? what is it which these witness against thee? But Jesus held his peace. And the high priest answered and said unto him, I adjure thee by the living God, that thou tell us whether thou be the Christ, the Son of God. Jesus saith unto him, Thou hast said: nevertheless I say unto you, Hereafter shall ye see the Son of man sitting on the right hand of power, and coming in the clouds of heaven.” (Mat. 26:62-64). Can you see the similarity in verse 64 “From now on you will see the Son of Man sitting at the right hand and coming on the clouds of heaven.” with Revelation. 1:7, “Behold, he cometh with clouds and every eye will see Him, even those who pierced him, …”? We see that “they” and “you” point to a specific group who receiving the warning presented, which will make the judgment about it and we see it happen. This is not about to miss understand, but rather understand that this refers to the judgment in 70 AD as Jesus prophesied of many other places too (Matthew 21:33-43, 45, 22:1-7, 24:1-34). “When the lord therefore of the vineyard cometh, what will he do unto those husbandmen?” (Mat. 21:40). “Therefore say I unto you, The kingdom of God shall be taken from you, and given to a nation bringing forth the fruits thereof. And whosoever shall fall on this stone shall be broken: but on whomsoever it shall fall, it will grind him to powder.” (Mat. 21:43-44). “And when the chief priests and Pharisees had heard his parables, they perceived that he spake of them.” (Mat. 21:45). “But when the king heard thereof, he was wroth: and he sent forth his armies, and destroyed those murderers, and burned up their city.” (Mat. 22:7). This is exactly what happened in 70 AD when God’s power “draw” the Romans over the country (Israel) and destroyed those murderers, and then put the city (jerusalem) on fire. This is prophesied earlier in the Gospels and stands as a confirmation. As we know, the Romans was an instrument of Christ’s Crucifixion, but the Bible repeatedly expresses Israel’s covenantal responsibility for the whole terrible event. “Then answered all the people, and said, His blood be on us, and on our children.” (Mat. 27:25). “But they cried out, Away with him, away with him, crucify him. Pilate saith unto them, Shall I crucify your King? The chief priests answered, We have no king but Cæsar.” (joh. 19:15). “Him, being delivered by the determinate counsel and foreknowledge of God, ye have taken, and by wicked hands have crucified and slain:” (Apg. 2:23). … and more: Acts. 3:13-15, 5:30, 7:52, 10:39 and 1.Tes. 2:14-16. She (Israel) should actually known better (Luke 19:41-44), and in Revelation. 1:7 it is offered a judgment on “those who pierced Him”, which requires that the judgment had to fall in the first century while “those who pierced Him” was still alive. The time frame can we pick again from Revelation. 1:1, 3. Revelation. 1:7 says even more, that “all kindreds of the earth shall wail because of him.” The Greek word used and translated to “earth” is (gè) which can also be translated into country. It actually refers to “the land of Israel”, ie “The Promised land”. The New Testament speaks the word (gè) either on the promised land as a whole, or only part of it, such as: “And thou Bethlehem, in the land of Juda …” (Matthew 2:6), “land of Israel” (Matthew 2:20, 21) “The land of Zabulon, and the land of Nephthalim” (Matthew 4:15) and “the land of the Jews” (Acts 10:39). Land of Israel as a whole also contained the 12 tribes and then we filled up all the information that Revelation. 1:7 is … well almost everything. Revelation. 1:7 There are other parallels in the Bible as Mat. 24:30. Many people have told that “… for the Lord is one day as a thousand years and a thousand years as one day,” to undermine Revelation. 1:1, 3, that it can actually go a couple of thousand years before the events in Revelation will happen. What Peter do is told speaks of God and give a statement concerning God, while John gives an instruction to living people in the churches, about their developing suffering. This is a big difference. The second is “every eye shall see him” (Rev. 1:7). 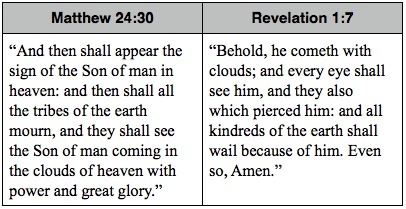 Here, many believe that the whole earth will see Him coming, and they hide behind it to tell that that TV cameras are in many places in Jerusalem that will broadcast, just Jesus’ second coming. But “every eye shall see him” simply means that this will be a public event that is not hidden in a corner. You’re probably agree with me that for surely went not the “whole church” (children, elderly, weak, little girls and women) out to war. (Jos. 22:12), or that Israel sinned against God literally on “every high hill and under every green tree” (Jer. 2:20), or literally “all Judea” (including infants, aged and weak) went out to hear John the Baptist (Matt. 3:5). When we look at the Greek words in this sentence, “Every eye will see Him, even those who pierced Him”, it can also be understood as “every eye shall see him, it is they who pierced Him.” I know it can be a bit confusing about the translations when I bring up Greek words and how they could have been translated slightly differently, etc., but it is of great help. Just to be clear, I am no expert in Greek and will probably like many others get information, etc. from those who know more. Nevertheless, I believe that the translation we have today really should not create to much confusion. I believe it is what and/or which teachings we already have in our mind that is the worst enemy. Finally, I want you to notice another thing. “Those who pierced Him” has been dead for over 1900 years. So to get this to fit into the mindset of “millennial” believers, we must bring out the procrustes bed, cutting, pulling and expanding (post 2) so that the timeframe for the prophecy can be inserted in our time. It would fit more to their mindset, unfortunately. Those who pierced Him . In day when Jesus come will be a resurrection from death. And judgment of all nations. Every body pierced him. With their sins. Ones of them did the repentant from this, another’s not. I think pierced meant literally pierced with nail on the cross. I can’t see anywhere it says, literarily or in context, that “pierced” is about sins. But if we want to hold a thought for ourselves that; ‘everyone who sin hurt Jesus’ we may “say” it, but we can’t interpret the scripture that way. About judgement of all nations. I think you have to read on all through the series to se my view, because I don’t hold to the view who says that the judgement is in the future. If you have read all part of the series, I will be happy for your comment and more explanation of your view and why. If you are agree with my view, I will also be happy for comments. All debate if useful when it shapes us and sharpen us. 🙂 God bless!